Pvt. 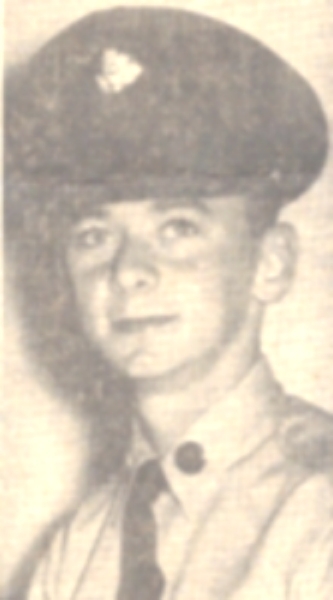 Larry E. “Skip” Davidson, 19, of Manchester, Maryland, joined the Army in early April of 1962. He undertook the rigorous training in combat arms and then the techniques and methods of paratroopers who get into battle from the air. His entire paratrooper class got orders at graduation to ship out to a station in Germany. Reinforcements were urgently needed in the event that troubles with the Soviets got out of hand over the Cuban missile crisis and the Berlin wall. The soldier’s mother, Mrs. Elmer Davidson, told a reporter “We didn’t even know Skip had left the country when we received the telegram from the adjutant general telling us he was among the missing,”. She and her family were shocked with the news. Just two days before the Atlantic ditching of Flying Tiger Line Flight 923, Skip Davidson called home to tell his family that he thought he would be leaving by ship within a week. He didn’t know any details. The family was shocked to learn several days later that he was already gone. He didn’t leave on a ship. He left on a chartered four engine Lockheed Super Constellation. That aircraft never made it to Germany. It crashed in the raging North Atlantic Ocean some 500 miles off the coast of Ireland. “One of the starboard engines (right side) began to shoot flames. The pilot cut it off. The plane could make it on three engines. “Then a port engine threw a prop. It was possible to make it on two engines,” he wrote. “Pilot said it would be five or six hours to the nearest airport. We just knew we couldn’t make it. “The plane flew on for an hour and a half loosing altitude steadily. The passengers practiced ditching procedures and waited. “Then I looked out the window and saw white caps below. I knew it was now or never, swim or die. “Suddenly the lights went out so we could get used to the dark. Then the pilot said, ‘It looks like we’ll have to ditch,’ and so we all leaned forward and got set for the impact. “Then it happened. The plane hit the water. All of the seats tore loose and went to the front of the plane. “I was on the right side of the plane and ended up on the left about 10 feet from where I had been. Sparks flew and some women screamed. “When I finally stopped, the seat was on top of me and the water was gushing in from all over the place. You could hear the waves hitting the side of the plane. “When I first tried to stand up my seat belt was still fastened and I had to sit back down to open it. By this time some people were out and others were still in a pile of seats and trash. “When I first got my senses I noticed the water was just above my knees and I said to myself “I got to get out.” So I stepped upon my seat and walked across most of the others. “I got to the back exit and saw three people waiting in line to get out. When it was my turn water was three inches above the top of the door, but where I was standing it was up to my chest. “I saw a few people behind me. “I dove under the water and out the door. The rest followed me. Outside a wave took me under and I got a good drink of salt water. Then I inflated my life vest. “People were struggling all around and yelling, ‘Where’s the raft?’ Then suddenly I saw a shadow and swam towards it and there it was. Three boys got me on and we helped others until no more were in sight. “It took five or six minutes for the plane to sink, but most got out but did not make it to the raft. “The plane had five rafts but only one was found, so you just know somebody screwed up. “After we all got to the raft and calmed down, we tried to find out who and how many were missing. “The pilot had a flashlight with him, but he could not use it. He was badly cut on the forehead and the blood had caked over his eyes. So Joe Hoffer of Alabama used the flashlight. “As you read we had 51 people in the raft build for 25 and you can imagine all those people screaming with pain if anyone tried to move. I stayed in one position for five hours and the cramps were killing me. My legs were double under and that’s the way I stayed until we were rescued. “To top off all of our troubles, the raft was upside down and the safety equipment was underneath. Celerina, 2 days after rescue. Skip Davidson continued writing, describing boarding the ship on rope ladders, being treated by the crew of the Celerina and his wounds. Skip died at the young age of 49 before he could tell his son, Brian, all of the details. Fortunately for us, Brian and his brother, Craig, only recently found his keepsake box, which they passed on to us. This entry was posted in new combat troopers and tagged air disaster, Flying Tiger 923, Larry E. Davidson, Manchester Md., paratrooper, Skip Davidson. Bookmark the permalink. 7 Responses to Skip Davidson: I knew it was swim or die. WOW WHAT A STORY. THERE SEEM TO BE SO MANY LIVES THAT WERE TOUCHED ON THAT MOURNFUL DAY. “…so you just know somebody screwed up…we saw the ship lights and knew we had it made…” I could hear that nineteen year old boy’s voice when I read those words. Oh my. I’m happy to know that his son Brian was able to pass along his dad’s keepsake box. Fort Campbell, KY 101st ABN. I watched the Connie’s take off from Fort Benning and was sad not to be going to Germany. Please verify (if I’m right) that the Canadian war ship H.M.C.S. Bonaventure and it’s 4 (four) Destroyer Escorts attended this tradgety..Some of the persons involved in this mishap were taken to the H.M.C.S. Bonaventure’s sick bay & their (the ships) milk cooler was emptied and used as a morgue. The Canadian ships then proceeded to Shannon Ireland. I was serving on the H.M.C.S. Bonaventure when this mishap occurred. Please if you can, verify this happening I would be so grateful to show my grandchildren the perils of the Atlantic.